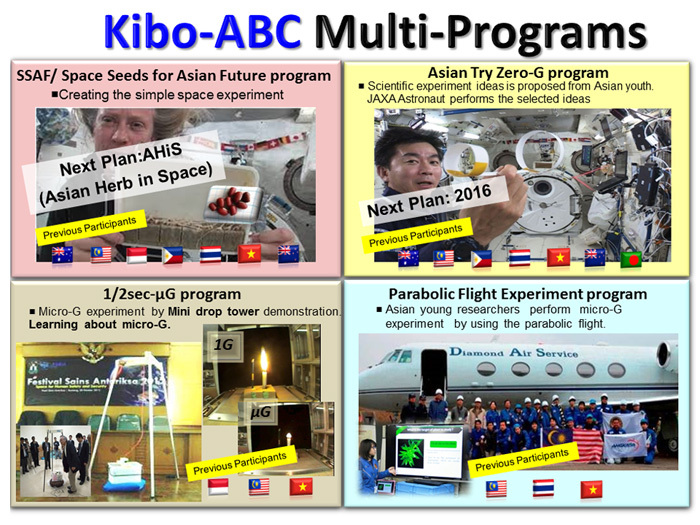 Kibo-ABC is a collaborative program established by the Space Environment Utilization Working Group (SEUWG) of APRSAF, aiming to promote ISS/Kibo utilization in the Asia-Pacific region and to share and build on the outcomes of “Kibo” utilization. 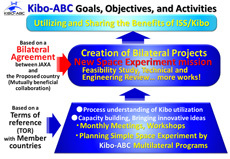 The objectives of Kibo-ABC include: promotion of Kibo utilization among researchers and engineers in Asian countries, accumulation of experience and enhancement of capacity among participating space agencies through implementation of projects utilizing Kibo, and creation of bilateral cooperation projects on Kibo utilization between member countries and Japan. Aiming at human resource development and capacity building for future Kibo utilization, Asian space agencies are taking the lead in designing relatively simple space experiments for Kibo using materials that are familiar to people on Earth. More than 40,000 participants from various countries contributed to creating reports as a part of SSAF 2013, and some participating countries have developed original spin-off projects. Demonstration missions are ongoing, with the aim of further implementation in 2016. With the goal of promoting manned space experiment activities aboard Kibo, a Japanese astronaut performs selected experiments covering themes proposed by youth from Asian countries. 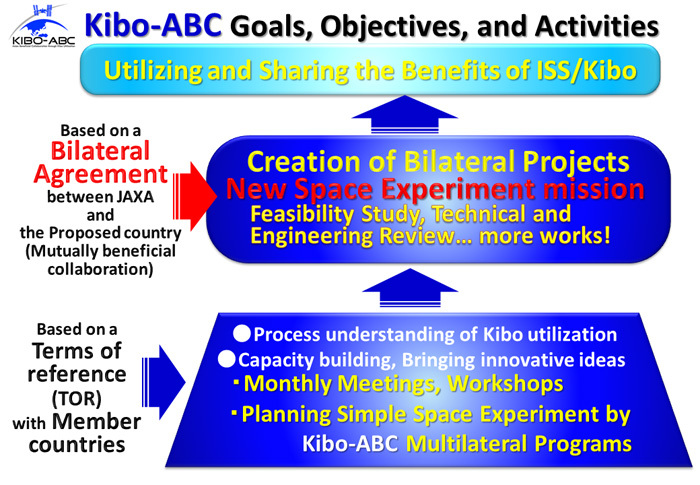 Member countries of Kibo-ABC are invited to submit proposals for experiments. Member agencies will work on the screening of proposals according to selection method, and this could develop the skills needed for feasibility studies of Kibo experiments. After feasibility assessments by JAXA, the final selection of experiment themes will be determined by member agencies. There are 2 categories for this program; Category 1 is for students under 18 years old, and Category 2 is for young scientists and engineers, ages up to 27 years old. The category has been divided into two since 2015, to create more innovative ideas. Young researchers and engineers in Asian countries are invited to test their ideas regarding “flight experiments,” which are normally implemented for on-ground verification and training purposes prior to full experimentation in space. Through such experiments, participants have learned methods of systematic operations and the importance of teamwork—both are integral to successful research projects. Former participants are now successful in various fields, including advanced life chemistry and aeronautical engineering. Activities involve conducting microgravity experiments using a handmade mini drop tower, whereby the microgravity environment is created, and holding seminars. This program has inspired other countries and agencies to use mini drop towers for the dissemination of knowledge regarding basic physical phenomena under microgravity conditions.